This morning we lost a great man in Peter William Thomson. He was a special business partner, a mentor and a very dear friend. I first met Peter in 2002 in Melbourne, Australia. I remember the meeting very well. I was very nervous to be in the same room as my boyhood hero. He was my role model and my inspiration for taking up the game. However, he immediately relaxed my nerves and we spoke about golf over a long lunch. Two years later we started our design business and the collective of Peter Thomson, Ross Perrett and Tim Lobb became formally known as Thomson, Perrett & Lobb (TPL) which we ran together till 2016. Peter, Ross and I always tried to meet at The Open Championship. These occasions gave me a unique insight into Peter’s legacy, his legendary status as a five-time Open Champion and his love of links golf. 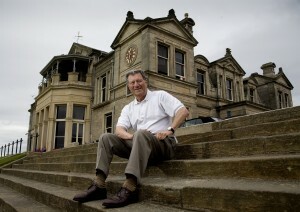 One my favourite times with Peter was when The Open returned to St Andrews. Ross and I would visit Peter and his wife, Mary, in their home in Hope Street for morning tea and a chat. It was always such a relaxed atmosphere and a special way to start the day. Sometimes we would walk the Old Course together, but often we would simply be at his home, watching the action unfold on TV. I will always treasure these very special times with Peter and his family at the Home of Golf, somewhere he loved so much. Peter was a huge supporter of TPL and we enjoyed many trips together. Peter always travelled light, and always knew the fastest way through any airport! When onsite at one of our many projects, Peter’s golfing brain would always take over, and his experience of playing golf around the world is wrapped into every one of our designs, and I’m proud this legacy will live on. 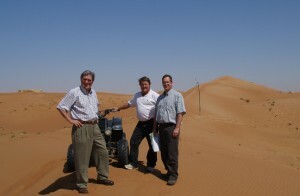 Peter, Ross and Tim onsite in the Middle East. One of my favourite pictures. Peter cool as a cucumber. Ross and I baking. Peter was a lover of natural looking golf courses, he always wanted to sit a course into the land and the environment with minimal change, and the core of his design philosophy was always to make the golfing experience enjoyable. I will dearly miss Peter’s insights, intelligence and company. He was a great man, a friend and an inspiration. Peter William Thomson, rest in peace – a round well played.